The Arcadia area of Phoenix borders Scottsdale on its East side and is known for green, grassy tree studded lots, previously planted in orchards, and is on the South side of Camelback Mountain. 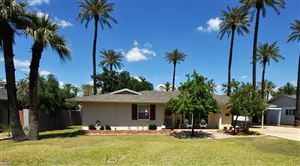 A favorite of all for its friendly neighborhoods, schools, playgrounds and larger lots with single family residences, this is one of Phoenix's most stable, popular areas. Bill Mahan, a native Phoenician, has been assisting clients buy and sell residences in Arizona for over 10 years and achieved the International President's Award in 2013 placing him among the top 6% of Coldwell Banker agents worldwide. His executive leadership experience, combined with his knowledge of residential real estate in the Greater Phoenix area make him the number one choice for buying and selling homes and properties. Bill assists clients in purchasing and selling homes and condos in Scottsdale, Paradise Valley, and in Phoenix including vacation properties, first home buyers, corporate relocation and move up buyers. Recently, Bill has assisted a number of clients who have desired to move to a smaller property, freeing themselves for more travel and time with family. Bill refers to these clients as his Encore buyers. Encore buyers are interested in marketing their existing home and relocating to a fine home in the same general area, but with less upkeep, a little less space, and possibly a gate guarded community. Because of the limited availability of these Encore homes, it is critical for buyers to work with Bill, who keeps close tabs on homes available and coming to market. Most of Bill’s business is derived from referrals from friends, past clients and business associates, so if you are in the market to move or know a friend, relative or business associate looking to move, call 602-692-7092 and talk to Bill, so he can provide you and your friends with the same excellent service he provides all of his clients.